And because I’m aaaall about spreading the loooove, I’m starting this weekly feature for you! Saddle up your blender and bag some fruits & veggies…It’s time for the Crispy Cupboard’s Saturday Smoothie Roundup…yeeeeee-hawwwwwwww! Although I prefer to use the Spanish name for these frosty meals-in-a-glass: licuado. Which quite literally means: blended. Pretty self-explanatory. My lifelong love affair with luscious licuados, began as a child. Back in the days when adding sugary Quik(tm) powder to your milk was never given a second thought…because fortified! vitamins! the label says so! (is it bad that I still think fondly of the strawberry stuff?). Every now and then, my mom would throw milk, a banana, and Quik powder in the blender, with possibly an egg or two, and whip up a tall glass of velvety, fruity (or chocolatey), deliciousness. It was always exciting to have milkshakes for breakfast. One time she ran out and used strawberry jam instead…and my brain exploded. That was the day I realized that smoothies and I belonged together like banana & peanut butter. BFFs I tell you! at least 20 grams of protein. 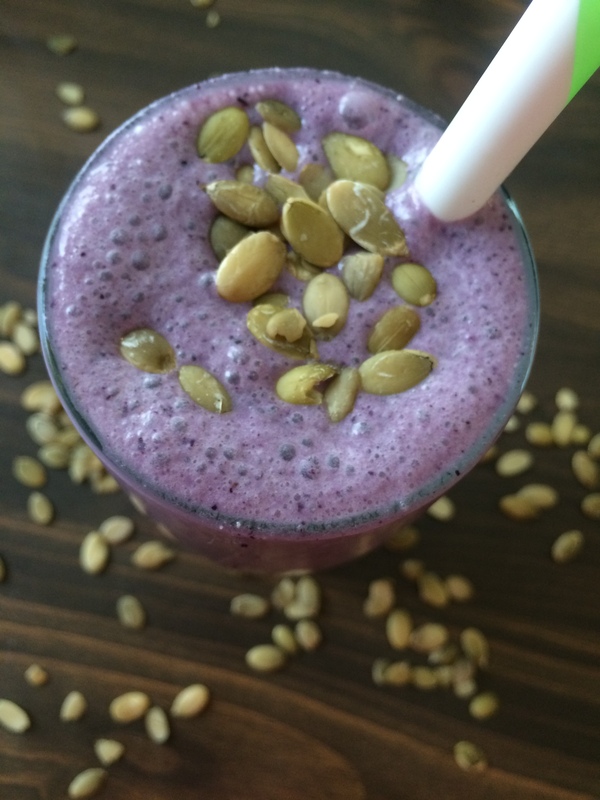 Blueberries, yogurt, pumpkin seeds & banana collide in a frosty flavor explosion. Blueberries are the nutritional powerhouses of the fruit world. Bursting with antioxidants and vitamin K, they’re quite the bang for your buck nutritionally speaking. And they make food purple! And purple food is fun! Plain Greek yogurt rounds this out with abundant protein (twice as much as the regular kind!) and vitally important probiotics. (Why probiotics rock). But not all brands are created equal. Make sure you use a brand with a short ingredient list: milk & live active cultures are the only things you should see on the label. 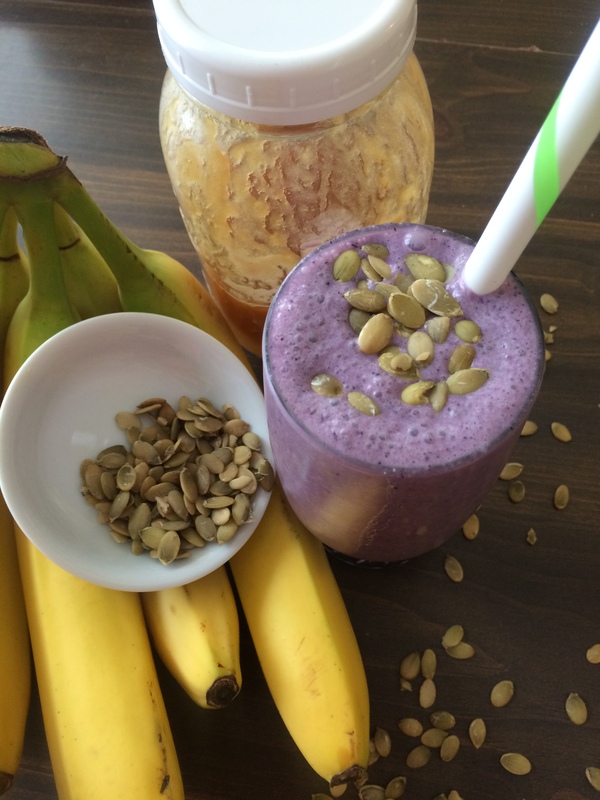 This shake is not low in carbs, but the natural sugars from the fruit make it a great post-workout recovery meal. Nutrition Breakdown: 400 Cals. ; 24 g protein; 17g fat; 45 g Net carbs; 7 g fiber.